All around this region of Victoria are the remains of dams, water races and mine shafts. 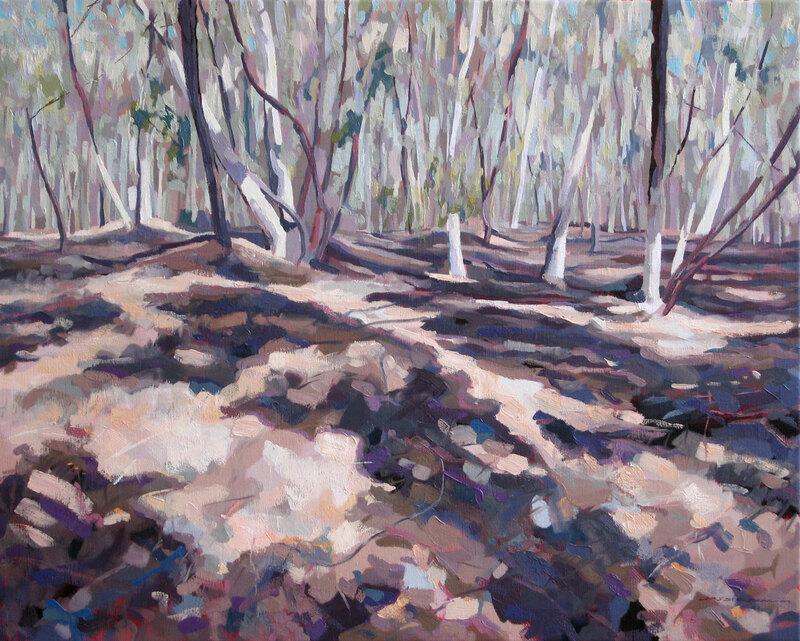 You can see the spoil heaps with new-growth gum trees growing out of them in this painting. Five years ago, hiking through the Victorian bush was hot thirsty business as we were well into a seven-year drought and the ground underfoot was crunchy and friable. Every footstep kicked clouds of fine dust into the air and very quickly our legs and boots would take on the colour of the land we walked over. I wondered about the miners and their families, surviving in a land where, if they dug a hole, they would be more likely to find gold than to find water. I am particularly fond of this painting as it captures exactly the light, heat and brittle desiccation of the land at that time. I also have fond memories of painting it as it was one of those processes where everything just works… every brush stroke has the right meaning, every colour mix is just what I want and so on. It can often be the case that I like certain of my works more because of how the process felt while I was making it than how they ended up looking. I guess most artists are like that to some degree. We are the least reliable critics of our work, maybe? That’s true, Hollywood. Each viewer takes what they need from an artwork, and I feel that it might be arrogant for an artist to demand that a viewer take exactly what the artist had planned them to take! That might be one of the reasons I have a suspicion of idea-based art (unlike sensory experience-based art, or expression art).